Keep up your company's growth in eCommerce! So how do you keep these factors optimized for inventory management to lead to healthy growth in eCommerce? Here we’ll be exploring best practices for these factors. Inventory optimization processes are often highly complicated and require a significant amount of manual work. That can in turn lead to shortages, wrong deliveries, wrong orders, and an overall poor service level. The core of optimization is streamlining. Broadly speaking, this includes improving inefficient and ineffective processes by simplifying or eliminating unnecessary steps. This can be done with advanced technology or even by implementing new approaches. For example, the purchasing departments of many of our eCommerce customers only responded as demand changed and didn’t proactively anticipate demand changes. Therefore, orders were only placed when demand had already increased or a certain minimum stock had been reached. But this process leaves you a step behind. If the product is out of stock at the supplier’s end or if any delivery disruptions occur, you might not be able to maintain your promised product availability. When left to be done manually, there’s also a time discrepancy between recognizing the stock shortage and placing the order. The solution? Automation! That means that necessary orders are automatically identified, communicated and ultimately placed. But that’s just the first step – a fast moving environment such as eCommerce also requires dynamic aspects to keep up growth in eCommerce. Thus, inventory levels such as the safety stock level should be adjusted automatically on a daily basis, preferably hourly or almost in real time. So what’s the best way to implement automation? Advanced support in the form of software! Automation is by no means trivial and can quickly over-strain standard ERP systems. Nor is it profitable to manually calculate inventory levels and order quantities several times per day. By implementing advanced software in this area, you stay prepared and at best a step ahead of the competition by being able to guarantee and deliver the maximum service level. Additionally, employees in purchasing will be relieved to focus on more important tasks. Of course, product availability plays an important role in receiving high reviews, but other aspects are also important. One is readiness for delivery, which is why it’s essential that your company is able to process all open orders in a timely manner and maintain a complete overview of the inventory. This presents a challenge for many businesses in eCommerce. For example, inventory levels change due to returns or orders have to be split if only part of the shipment is available, etc. Therefore, total visibility of inventory is necessary. That means that the displayed inventory levels in your system should be virtually identical to the actual inventory. Without this total visibility, inventory management becomes a major challenge, which will lead to negative reviews and reputation damage as a result of delivery failures/delays. Nowadays it’s also necessary to rely on modern classification models such as ABC or XYZ analysis. By using these methods, you can classify your products based on value and turnover rate and define corresponding service levels. Simply put, a service level of close to 100% should be pursued for valuable products with a high turnover rate. The service level thus affects inventory levels because if you want to be able to deliver virtually seamlessly at all times, safety stock levels have to be adjusted accordingly. The key to solving this dilemma is advanced and dynamic demand analysis. A variety of factors have to be considered for demand analysis which, based on our experience, are often neglected or not realizable with the company’s existing systems. One often overlooked factor is seasonality. Almost every type of product is subject to seasonal demand fluctuations which have to be identified and considered accordingly – and that should happen automatically in order for the supply chain to run more effectively and efficiently. Generally speaking, any possible demand fluctuation should be considered and analyzed; this usually happens based on the sales history. While this is by itself the correct approach, it entails major risks. Many companies tend to adjust the analysis only at long intervals such as once per week or month. Based on our experience that’s much too infrequent and increases the risk of overstock. Demand in eCommerce can change rapidly – for example, because of a particular initiative of a competitor regarding a specific product. This will of course have an immediate impact on price comparison search engines and influence buying behavior/demand, meaning you have to keep your demand analysis as updated as possible. Lastly, there is often the issue that not enough historic data is available yet because the company is new to eCommerce or because it recently broadened its product portfolio. Common ERP systems – if they are even offering demand analysis – often run into problems and only work very inaccurately with these items. Therefore, specific solutions for inventory optimization via advanced algorithms provide the opportunity to create accurate forecasts early on and avoid excess inventory – even with a limited amount of historical demand data. Keep up your company’s growth in eCommerce! After having read the two parts of our blog series, you now know exactly what’s important when optimizing inventory for healthy growth in eCommerce. It’s best to apply these practices early on to be on the safe side. Maybe you already have a few of these best practices in place, but by limiting these changes to your business, you are limiting your potential for future growth. 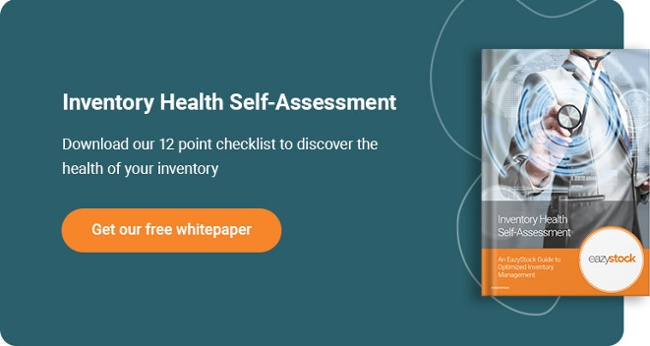 Check where your inventory could use some help with our Inventory Health Self-Assessment. This guide supplies you with 12 questions about core areas of your inventory to determine what issues you need to address to stay competitive in eCommerce!